It seems almost daily that we get new feature requests for Nagios XI, and thanks to a great extensible design by Ethan Galstad, the development team here at Nagios is able to produce new features and components for Nagios XI on a fairly regular basis. However, as the popularity of Nagios XI continues to grow, so does the need for custom features, modifications, and tools for our customers to use. We’ve added several new features and developer hooks into this most recent version of Nagios XI that we wanted to highlight for users who are interested in creating their own custom feature. #1. Custom login splash. Several of our resellers have requested the ability to customize the login splash page when users log in to direct their end users to their own support channels and services. We’ve add the ability to allow users to specify their own PHP include for that splash by using the Custom Login Component. A template splash file has been added to the Nagios XI directory tree, and will be preserved through upgrades if users want to modify it. This file is located at /usr/local/nagiosxi/html/loginsplash.inc.php. #2. Custom status column. We’ve added some new callback functions with this release of Nagios XI, one of which is a callback that allows users to add a new table column to the host or service status tables in Nagios XI. A developer example that adds the host notes field to the status tables can be downloaded from the following link. Custom Column Component. #3. Custom table icons. Thanks to active community member jsmurphy for this one. We’ve added a new callback function in Nagios XI where custom table icons can be inserted the status tables to act as links, or to perform special actions. This feature is demonstrated in the latest version of the Graph Explorer component, where it inserts a graph icon that can be clicked to show a performance graph pop up for the selected host or service right from the status table. The bottom line is, we love feature ideas! We base our development priorities largely on what users are requesting from us, so if there’s a feature you want to see in Nagios XI, by all means post a request to tracker.nagios.com or discuss an idea with our tech team at our Nagios Ideas forum. Category: Community, Components, Cool Stuff, Development, Graphs, Nagios XI, Tech Tips, UI and Uncategorized. 4 Comments Tags: Components, Custom, Development. I’ll post setup instructions below for users who also want to play around with this setup. Note: This setup is not intended for production installs, use this in test environments only! 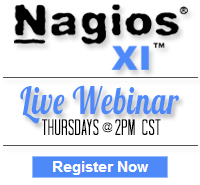 Start with Nagios XI installed, either through the pre-installed VM or with a manual installation. I chose a manual installation for this demo so I could set up the hardware to my liking and give it sufficient hard drive space to test a LOT of hosts. My first attempt at the prototype only had 10GB on the box, and filled up quite quickly because of performance data. .I ran the following commands after initial Nagios XI installation and setup was completed. You can verify the upgrade succeeded by reviewing the /usr/local/nagios/var/nagios.log file. There should be some new warnings about obsolete definitions like “failure_prediction_enabled”, which we won’t worry about for now. For now I’d like to see what kind of performance impact I can expect for a large number of checks being run on this machine, so I need to quickly create a large number of checks. I’ll achieve this by running a tools script that we include with every installation of Nagios XI. I chose to use static configs instead of the CCM for this benchmark for ease of setup time, and also easy removal later on. This also creates a list of checks with 25% of the services showing up as critica, which is useful in testing a system stressed with alerts and notifications. However, I’m also going to turn off notifications and event handlers during this setup phase just to make sure I don’t bottleneck somewhere and tank the entire box. Now lets restart Nagios to start using the new configs. After adding 1000 hosts and 4000 services all at a 5mn interval the CPU load is running at a nominal level, averaging anywhere from .30 – .70, which is pretty impressive for a 4 core system! There is still some Disk IO because performance data processing is happening for each service, and this will likely be one of the noticeable bottlenecks as we add more checks to this system. After the system levels out and all of the checks are settled into a hard state, I turn on notifications and event handlers and begin watching the system and testing for bottlenecks. I’ll post back with some results soon! If there are any XI users out there who want to give this a shot in their test environments and post back with their results we’d love to hear what you find! After many months of anticipation and hard work, we are pleased to announce Nagios XI 2012 Beta is ready for public testing! XI 2012 is loaded with a variety of new features, and we’d love your help in making sure that 2012 is ready for full release as soon as possible. A key difference with the release of 2012 is that there will be both an Enterprise Edition and a Standard Edition, with the Enterprise Edition being targeted at users with larger environments. Category: Components, Configuration, Development, Nagios XI, Site News and Wizards. 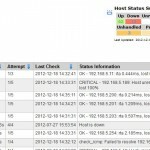 17 Comments Tags: 2012, BPI, Capacity Planning, CCM, Scheduled Reporting.